The Ohio American Legion Baseball State Tournament is a grand event and 2018 was no exception. 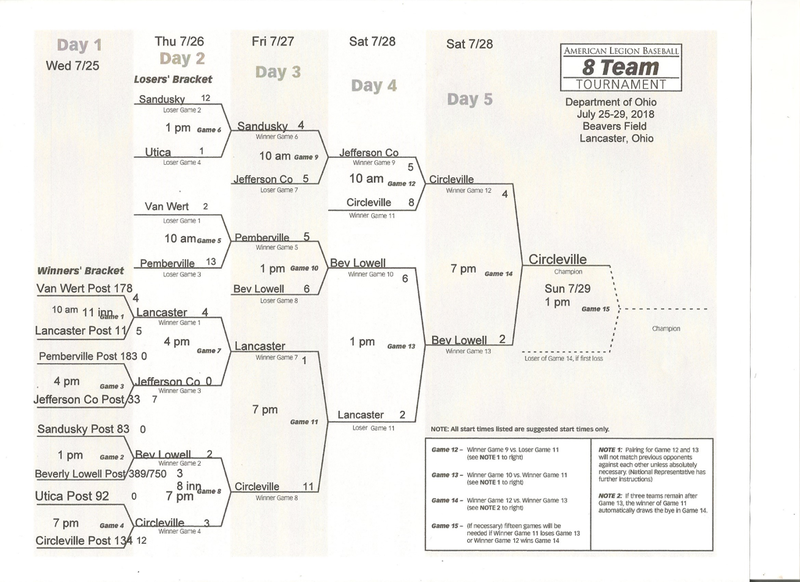 8 teams from across the state were competing for a single title; numerous college coaches were scouting players for recruiting opportunities; 3 different radio stations - one an ESPN affiliate - were broadcasting back to home town fans; a FOX News affiliate from North Eastern Ohio shot news clips for their local audience; and no less than a half dozen newspapers wrote stories and interviewed coaches and players. For Thursday's nightcap game between Beverly Lowell Post 389/750 and Circleville Post 134, an estimated 1000 people came to watch. Around 1000 spectators attended Friday's nightcap game between Circleville and Lancaster Post 11. In total for the 5 day tournament, approximately 7000 fans came to Beavers Field in Lancaster to watch American Legion Baseball (ALB). It was a bustling place. And we can't fail to mention, hundreds of Phyllis Burgers were served to happy fans from Phyllis' Home Plate! The 2018 Tournament outcome was no less spectacular and could be titled "The Year of the Panther". The Circleville Post 134 Panthers swept through the 2018 Ohio ALB Senior State Tournament with a decisive 5-0 record, racking up 52 hits, scoring 38 runs and only allowing 10 runs. Why title 2018 "The Year of the Panther"? Because just a week earlier, the Junior Panthers decisively swept through the Junior State Tournament with a 4-0 record. It is the first time in Ohio ALB history that the same program won both the Senior and Junior state championships. When asked about the Panthers' program after the tournament, Head Coach Jeff Lanman said, "The success of our program is because we try to recruit Student/Athletes and not Athletic students. Over the years we have found that kids who put the time in the classroom will not have any problem with putting the time and effort needed on and off the ballfield to become better players. I and all of my coaches emphasize four main things: 1. You have to be a Student/Athlete 2. You can always control your Attitude and Effort 3. Total Respect for yourself/parents/teammates/Coaches 4. Own your failures and weaknesses just as much as your successes and strengths." Regarding the strength of the Panthers' program, Coach Lanman stated, "We do work very hard in the off season to help our kids improve their hitting skills. I and my coaches try to use any technology available to help the kids improve. I have developed a ground up hitting philosophy over the years that I believe is easy to teach to players of all ages and to build on as they get older. The main focus of our philosophy is to take away movement not add. During the winter months we do utilize indoor hitting leagues with live pitching and lots of live pitching in cages to work on and improve swings. We do this with every age group and teach the same basic philosophy to all the kids regardless of age. We do have a great coaching staff and have been very lucky to have several great Coaches help us over the years. I can't stress how important it is that all coaches have the same vision and understand what the final goals are. For the Panthers, it is to hopefully help them become better people and not just better ballplayers." Coach Lanman also commented on some of his motivation for coaching, saying, "The backbone of the program is that we try and recruit kids at the junior high level and bring them up through our program. I and my wife (Real Head Coach) emphasize the value of an education and start trying to help kids prepare for that next step in life at a young age. Panther baseball is just the tool we use to further that goal. My wife and I were first generation college graduates in our families and know how tough it was for us to not only finish college but to just get there. Seeing any of our players go on and graduate from college or serve our country in a branch of our Armed Services really makes this all worth it." Coming into the tournament the Panthers were 30-9, even with playing a very tough summer schedule. "Playing as tough of schedule as possible helps us competitively. ", said Coach Lanman. "Playing 'travel teams' lets other people know that Legion Teams are just as good and if not better, and going to bigger tournaments helps get our kids exposure (I hate saying 'seen'), encouraging our kids to go to showcases like PBR helps put them on the radar and traveling the country staying in hotels as a team can really bond a team together. Most college coaches will tell you that Legion players have played a long hard schedule, competed for a league, regional, state, or national title and know that TEAMS win championships not individuals. I really believe this is what American Legion Baseball still has over the multi-billion dollar travel baseball business and is why I continue to be a part of it." The Panthers will advance to the Great Lakes Regional Tournament in Napoleon, Ohio. Their first game is Wednesday, August 8th at 4:30PM vs. Wisconsin state champs. The Regional Tournament winner will advance to the American Legion Baseball World Series held in Shelby, North Carolina. The competition was stout in the 2018 Tournament. Of the 14 games, 7 were decided by 3 runs or less. 2 games went into extra innings, including an 11 inning, 3 hour game where Lancaster Post 11 topped newcomers Van Wert Post 178 by a score of 5-4, and a 8 inning game in the round 2 match up where the Panthers topped Beverly Lowell 3-2. Beverly Lowell grabbed their second consecutive state-runners up title with a record of 4-1 and Lancaster Post 11 landed their 2nd consecutive 3rd place spot with a record of 2-2, losing only to the Panthers and Beverly Lowell. At the end, though, there can only be one champion. This year it was the Panthers of Circleville Post 134. And for each of the 14 games, there are two teams competing but only one team can win. Not everyone gets a trophy and it stings when your team is handed that second loss and has to leave the tournament. Baseball is a crazy game and affords ample time for 'what-if's' and 'could-have's, should-have's, and would-have's'. It also affords ample time for arm-chair coaching when things become clearer after the fact and causes the 'agony of defeat' to drag on for a long time. But, that can be said for any athletic competition. "I've had to the opportunity to participate in over 20 state tournaments. ", said Coach Al Beavers, head coach of Lancaster Post 11. "After time passes, it's not typically the scores, the games, or even the trophies that the kids remember. It's the experiences the kids have with each other that they remember." This Coach had the distinct privilege to stay at the hotel with his team and witnessed first-hand the experiences Coach Beavers mentioned. Kids were playing cards, wrestling, swimming, playing basketball, and sharing the breakfast table with other teams. What I witnessed was this: It was not so much a collection of ALB teams, but a collection of ALB kids. Late Friday night, for example, kids from Lancaster and Beverly Lowell - teams who were scheduled to play each other the next day to decide who would head to the championship game - were engaged in a ferocious, mixed-squat game of 'Can-Jam' in the hotel parking lot. It was hilarious to watch and I felt fortunate to see it. And when thinking about my own state tournament experiences from more than 30 years ago, I can attest to Coach Beavers' sentiment. I vaguely remember a few game highlights, but I vividly remember the fun I had as an ALB kid. "The funnest summer ever" was a recurring statement I heard from the ALB kids that I spoke with this year at the tournament and hotel. And I agree. "The funnest summer ever."